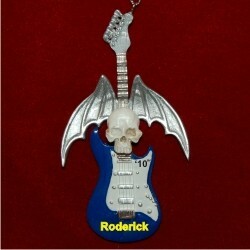 Rockers love the spooky details of the blue skull guitar personalized Christmas ornament sporting an eerie skull with bat wings above. Looking like something from an Alice Cooper or Ozzy Osbourne show, it's one of our musical instrument ornaments personalized by our lettering pros in an artistic font. A holiday display cord is attached, and the blue skull and batwings guitar ornament arrives in a gothic-styled velvet pouch.